Quirky Jessi: I see pink elephants...do you? I see pink elephants...do you? Once upon a time, it was a regular occurrence for me to speak of the pink and purple polka dotted elephants that were climbing in the trees. Well it isn't purple or polka dotted, but it is most definitely pink!! And this time, people aren't going to look at me like I'm crazy for it. You can see it yourself! minutes as the herd crossed the river. "This was a really exciting moment for everyone in camp. We knew it was a rare sighting - no-one could believe their eyes." 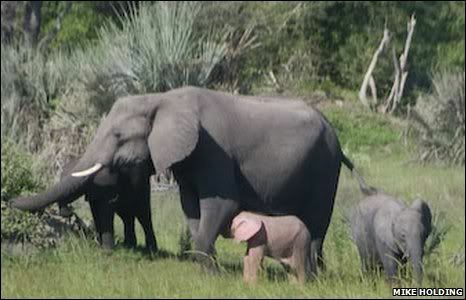 Albino elephants are not usually white, but instead they have more of a reddish-brown or pink hue. 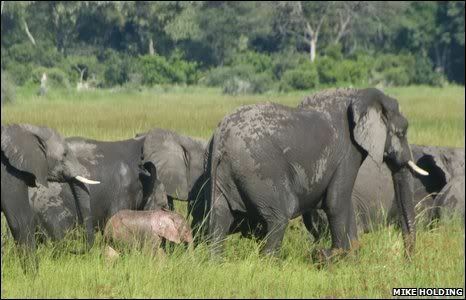 While albinism is thought to be fairly common in Asian elephants, it is much less common in the larger African species. Isn't it cute? And I know I'm not just imagining pink elephants because the news hit internationally, hehe. Pink elephants and a pretty new blog design... Score!